Leaving his Mark in Flemington: The Architecture of Mahlon Fisher ~ The History Girl! Flemington, New Jersey, the county seat of Hunterdon, is a town rich in history. Many of the homes and businesses' facades have been preserved, allowing visitors to step back in time, to a community that once was and still is vibrant and charming. In 1935, Flemington became famous for the Lindbergh trial; it was dubbed, "The trial of the century." Since then, the notoriety of this trial still lingers and a reenactment is staged yearly in the restored courthouse. But many who traverse these streets do not know that the the courthouse and many of the homes and commercial buildings lining Main Street are artifacts of Greek Revival architecture, a style popular between the 1820s and early 1860s, and built or influenced by notable builder Mahlon Fisher. On Main Street, just a short distance from the Hunterdon County Courthouse is a solid, square, two-story Greek Revival style home with over-sized pillars on its front porch. This charming home is now the headquarters for the Hunterdon County Historical Society, but has served a number of purposes through the years. The home was built by Mahlon Fisher. Fisher was born to a German family on February 8, 1810 in Amwell Township. His education was limited to a one-room schoolhouse and his education most likely ended at the eighth grade. When he was not at school, he was obligated to help on the family farm, which provided sustenance and a means of income for his family. At the age of sixteen, Fisher apprenticed to a carpenter where he learned the craft of fine house building. By the time he was twenty, he began purchasing property in Flemington and Delaware Townships. Always seeking opportunity, he most likely envisioned building homes or selling the land for a profit. Between the 1830s and 1840s, Hunterdon County was still young and not much development had taken place. But quickly Flemington was growing, as it was the center of all activity in the county. It was home to lawyers, accountants, and businessmen, in addition to the county government. On January 30, 1834, at the age of twenty-four, Fisher married Mary Ann Stires of Readington Township. Together, they had eight children, seven of which lived to adulthood. When Mahlon was 32, he purchased a lot on Main Street in Flemington. It can be surmised that by this time, his vast landholdings had brought him considerable wealth to purchase a property so close to the county courthouse. On this lot he built the Doric House. 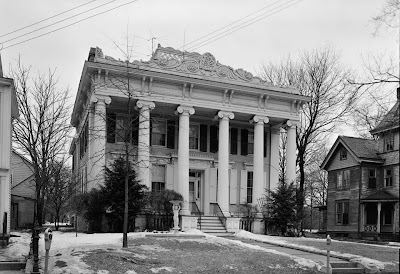 The house was completed by 1845 and was heavily embellished in high-style Greek Revival. Mason William Clarke constructed the rubble foundation. Upon the foundation, Fisher built a rectangular, three-story, three bay, frame home measuring approximately twenty-eight feet by thirty-two feet. He designed the home to have a full portico, with four square modified Doric Revival columns and two similar pilasters at the corners of the house. Above the portico columns is a Greek Revival entablature, denticulated architrave, and three window openings in the frieze with metal grills in palmette and foliate motif. In order to make a grand entrance, he designed an elaborate Greek Revival recessed doorway. Inside, Fisher spared no expense. In the front foyer is an elliptical staircase with decorative touches added to the stringer. The ceilings on the first floor are nine feet high. The front parlor is decorated with twelve tall, thin painted wood, paneled pilasters capped by a gilded leaf-and-dart motif plaster molding and a tall and deeply recessed plaster cornice. The original cast plaster center medallion remains with a 2012 reproduction period argon lamp. The fireplace in the parlor is made of black marble shot with gold. All of the doors on the first floor are finished solid cherry and more than two inches thick with a single recessed Greek Revival panel. Greek Revival recessed door with denticulated architrave. Greek Revival architecture was popular in America from 1820 through the beginning of the American Civil War. Prior to the mid-eighteenth century, Greek architecture had not been widely studied and access to that region was treacherous. It was not until 1762 when The Antiquities of Athens was published that the style and its design could reach a larger audience. Thomas Jefferson owned a copy of this book and appointed architect Benjamin Henry Latrobe as surveyor of public buildings in the United States. Through Latrobe and his students, many public buildings were designed in the Greek Revival style, paying homage to the birthplace of democracy. The movement was viewed as a symbol of our democracy and that was not only optimistic, but mindful of posterity. Mahlon Fisher embraced this national movement throughout his time in Flemington, designing a number of Greek Revival buildings. Between 69 and 71 Main Street, is a small yet striking building. Originally built in 1811, it served as an office for State Senator Samuel Southard. Southard was appointed Secretary of the Navy by James Monroe in 1817 and remained at this post in John Quincy Adams' administration. 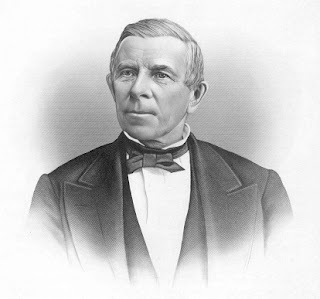 Southard became New Jersey Attorney General in 1829 after leaving the Navy and was voted New Jersey's tenth governor in 1832. After Southard departed for Washington, the building served as the office of Governor Vroom between 1817 and 1819. In 1820, it was purchased by Alexander Wurts and remodeled in 1840 at his request by Fisher. The building was initially a plain, squat, three bay structure with a door at the center. Fisher's redesign added the portico with four square columns with egg and dart molding on the capitals, a large entablature with denticulated architrave (no longer existing), a simple projecting cornice, and frieze decorated with carved wooden wreaths. Alexander Wurts owned the building until 1880. Since the early 1900s, the building has housed a number of Hunterdon County offices over the years. It has recently been restored. 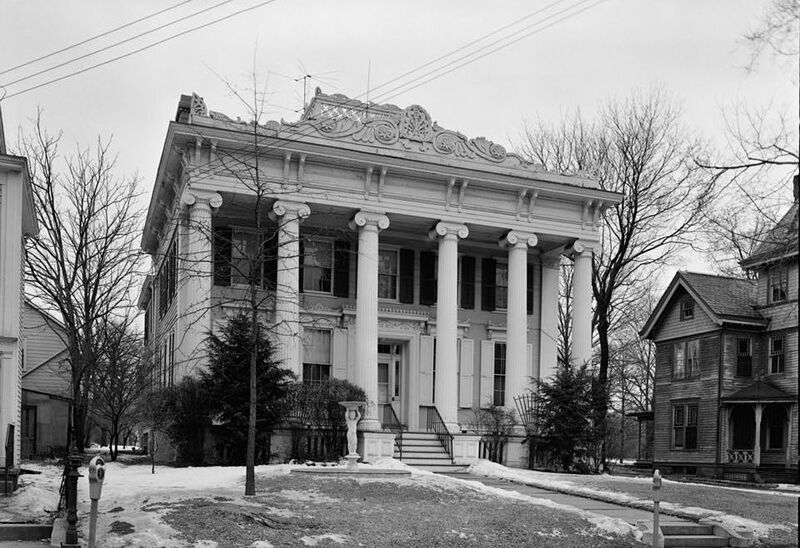 Fisher used Greek Revival as the inspiration for the Dorf House, located at 151-153 Main Street. Built in 1845, it was designed for two brothers as two symmetrical houses joined in the center with matching staircases. The homes had separate owners until 1942. Much like the Southard office and his own home, the house features a large entablature with denticulated architrave and six window openings in the frieze with metal grills at the front. He installed fluted Doric columns on the front porch and three 3/4 Doric fluted columns against the house. The porch's entablature has a denticulated architrave and a single molded cornice. The frieze is decorated with carved wooden wreaths, one of Fisher's trademark architectural elements. In 1847, Fisher built one his most elaborate homes for James Reading, grandson of the colonial governor of New Jersey, at 119 Main Street. James Reading's son played in the first intercollegiate football game between Rutgers and Princeton in 1869. The house has been said to have been built from a plan, but it is considered a showcase example of Greek Revival architecture. Many details on the home are exact replicas from Greek temples. The home is a center hall plan, five bays wide. The front of the home is graced by a two-story portico with a deep entablature and elaborate carved wood cresting above, which no long remains. Six fluted wood Ionic columns grace the porch with carved capitals. The doorway is elaborately carved and recessed from the plane of the house. Egg and dart moldings and the frieze above the doorway is decorated with carved scroll forms. The Reading residence's details represent the highlight of Fisher's career as a fine house builder. Fisher designed and built these buildings in a relatively short amount of time. In 1849, he and his family moved out of the Doric House when Fisher's interests turned to other business ventures. He became involved in a partnership with his brother Johnson Fisher, in Stockton, New Jersey, dealing in grain and lumber. In 1855, he moved once again to the town of Williamsport, Pennsylvania, where he would make his fortune in the lumber business. He bought large wooded lots in Pennsylvania and became involved in the lumber business with John Grandin Reading of Hunterdon County. Together they owned lumbering firms and planing mills. Fisher eventually became President of the Susquehanna Boom Company and Valentine Iron Works. He was a founder and President of the Old Lumberman's National Bank, an original member of the Williamsport Land Company, and held public office. He built a large mansion in Williamsport which was dubbed the "Million Dollar Mansion." Fisher died on December 28, 1874, at the age of 64, leaving behind a large fortune and legacy. Today, Fisher's home, the Doric House, has been restored to its former splendor. After Fisher's departure, his residence remained in that capacity but was later converted and occupied by the Odd Fellows, a restaurant, and a Methodist Church school. In 1970, the house was acquired by the Hunterdon County Historical Society with the financial help of citizens and business people. The museum is furnished in the Empire style, a design developed in France under Napoleon with curving lines, some caving, and occasionally ornamentation in brass with ivory or gold stencil. This furniture style was popular in the United States between 1820 and 1840. Attached to the Doric House is the Hunterdon County Historical Society's Hiram E. Deats Memorial Library. This research library contains over 6,000 printed volumes, manuscripts, newspapers, maps, broadsides, photographs and records of local history. In 2009, the Society opened a state-of-the-art, environmentally-controlled archives building in Raritan Township, designed to serve archival needs for the next fifty years. Today, the homes and buildings that Mahlon Fisher designed are iconic to Flemington; they are part of a living and breathing historic streetscape that has developed over time, yet his stoic and impressive buildings have changed very little, owed in part to his sound and high-quality building methods. The longevity of these buildings in the Greek Revival style speak truth to the fact that they create an air of permanence and invoke the ancient ideals of Wisdom, Truth, and Justice. Through the work of Fisher and the wisdom of future generations, these buildings have earned their place in American history.